"...I am pleased to recommend this beautiful and thoroughly-researched book to all those who love Britain, its railways and the art of watercolour painting." NOW SOLD OUT... A 3RD EDITION IS PLANNED... A tour around Britain during the middle years of the century using beautiful landscape paintings by leading poster artists commissioned by the railway companies. Reliving the days of steam when railways resembled travelling art galleries! Using many of the prints from his personal collection, the author takes us on a nostalgic tour of Britain in the mid-20th century, before modern town planning and the motor car had exerted their baneful influence on the landscape. From the mid 1930s to the late 1960s, trains virtually became travelling art galleries and it is this period which forms the centerpiece of this book. Dividing the subject geographically, he takes us on a carriage seat tour and covers six regions featuring a variety of scenes - from fascinating views of towns and cities to pleasant villages in rural areas; from the rugged mountains of Scotland and Wales to the numerous ports and resorts around the coast of Britain, dwelling on such pleasures as a railway outing to the seaside. He also devotes a chapter to the artists and the artwork and another to the collecting of carriage prints today. 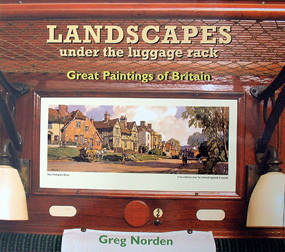 With its well researched, often humorous narrative, 200 illustrations with full captions, biographies of the artists and comprehensive print listings, this definitive book will appeal to railway enthusiasts and historians, art and antique collectors, lovers of watercolour and commercial art and all beguiled by images of the landscape during the age of steam. Signed copies by the author - a unique gift, available at no extra cost. NOW SOLD OUT BUT A 3RD EDITION IS PLANNED!